Lara Manetta loves to create pickles, condiments, and preserves that she can grab on the go to make easy and delicious meals. She's a full-time freelance writer but escapes to travel as much as she can. You can see more of her writing about food, booze, pop culture and life at c0ws.com. Most people are familiar with the standard napa cabbage kimchi. But, not as many people realize that Korea's spicy, fermented national dish can be made from dozens of other vegetables, as well. There are over 200 kinds of kimchi served in Korea, including many regional and seasonal varieties. Here in Florida, CSA season heats up when the weather starts to cool. When my first share included a pound and a half of tiny white and red turnips, I knew that they'd be perfect for kimchi. Kimchi is a very forgiving recipe. If you don't have Korean red pepper, substitute cayenne pepper or crushed pepper flakes. Vegetarian? Skip the fish sauce. By continually tweaking based on your preferences and what you have on-hand, you can create many types of kimchi for your table. Cut the turnips into half-inch dice. Salt the turnips. Use your hands to mix the salt and turnips completely, massaging the salt into the vegetables. The turnips will start to soften a little and give off brine. Cover with a plate and weigh down with a can of beans or another heavy item. Let sit for a couple of hours. Rinse and drain your turnips. Otherwise, you can wind up with results that are overly salty. Combine the remaining ingredients with the turnips and mix well. Pack your kimchi into a quart-sized canning jar. Push the vegetables down so that they are submerged in brine. Make sure you have at least an inch of headroom. Seal the jar. I like to use an airlock made with a ReCAP Mason Jar lid and a couple of purchased parts. If you don't have these available, you can keep it from over-pressuring during fermentation by burping the jar daily. Wait! 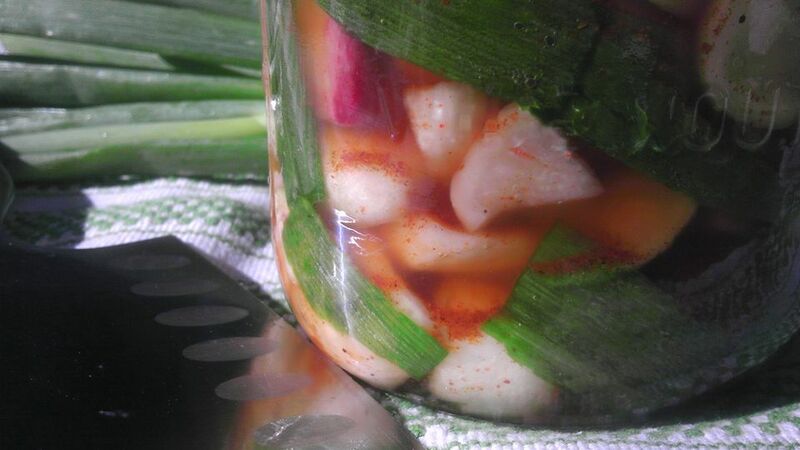 Your little jar of kimchi should sit at room temperature while it ferments. Place a saucer or plate under the jar to prevent messes if it overflows. Taste every couple of days to see when it is ripe enough for your liking. I like mine at about a week. The longer you let it ferment, the tarter it will get. When your kimchi is at your desired level of fermentation, place it in the refrigerator. It will last for a few months, but you'll probably wind up eating it more quickly as you use it in stir-fries, in soups, as a topping on noodles or straight out of the jar.